Hello, I'm L.Osborne, Welcome to my album. I design Faeries & Tiny Angels. The Faeries & Tiny Angels are not designed for children but, for the inner child all of us adults have inside us that love to collect them! 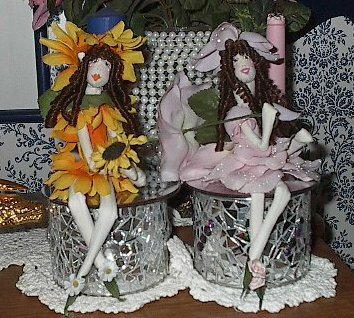 The Faeries are all made by me, L.Osborne. I designed my own pattern for them. They are 9 to 9 1/2 inches tall and each one is crafted out of fabric. Their clothes are made out of fabric or silk flowers. Each one is "1 of a kind." You just tell me what you want, hair color (brown, black ,blonde, red), eye color (brown,black,blue,green,or purple) and skin color (white or ethnic). Then the magic happens!! 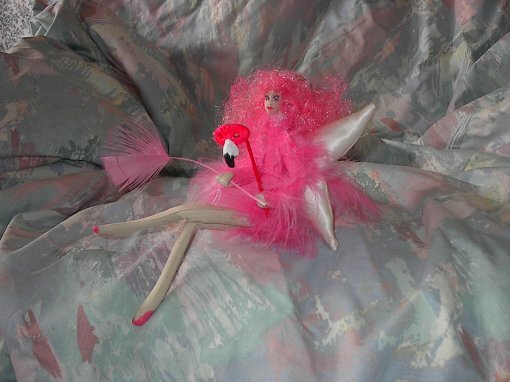 I go into my workroom and your darling little faerie practically creates herself. She has her own look, her own personality and her own magic about her! I will send you a picture of her and if you just love her, she will be yours as soon as I recieve the $25.00 plus $5.00 S&H (USA only). Shipping will be higher in other countries. Please email me about rates. 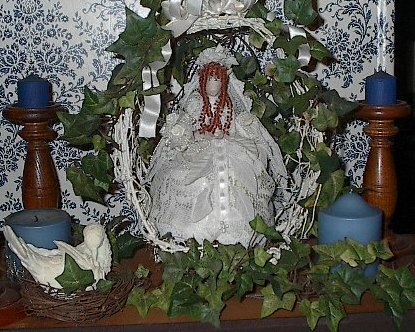 A Faerie Bride I made for my daughter Lindsay's wedding. No two dolls will look alike or be alike each one is "One of a kind."